When local homeowners are looking for the absolute best in high quality landscape design and installation work here in the Chesapeake area, smart homeowners know that they can always count on the team of Chesapeake landscaping service pros here at Winesett Nursery & Landscaping to provide them with exactly what it is they’re looking for. There is a lot that goes into creating the perfect landscape for your Chesapeake home, and it can be quite the difficult process, especially if you don’t have much experience in handling this kind of work. Our team of Chesapeake landscaping professionals have over 35 years of experience in helping local homeowners get exactly what they’re looking for from their home’s landscaping, and we are ready to help you do the same. Here at Winesett Nursery & Landscaping, we believe that you should never have to settle for anything less than the best when it comes to your Chesapeake home’s landscaping needs, and when you make the call to our team of professionals, you never have to. When it comes to high quality landscaping services here in the Chesapeake area, our team of landscaping pros here at Winesett Nursery & Landscaping wrote the book. Our team of experienced professionals will work with you directly to ensure that we know exactly what it is you are looking for from your home’s landscaping, and help you put a plan in place to make sure that you get exactly the kind of finished landscaping product that you’ve always wanted for your home. If you have any questions about our full line of high quality landscaping services, or if you would like to schedule an appointment for consultation with one of our specialists, give us a call today. Our team of experts are always standing by and would be more than happy to assist you in any way we can. 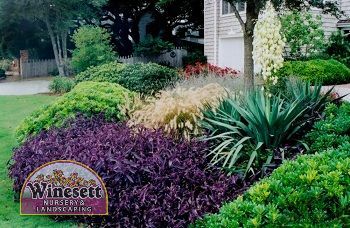 Here at Winesett Nursery & Landscaping, each and every one of our Chesapeake landscaping professionals work hard to ensure that you get exactly what it is you are looking for from your next landscaping project, and that the results are something that help you home to stand out from all the rest like you’ve always wanted. Whether you are just looking for landscaping maintenance to preserve what you already have in place, or you are looking to install something completely new, our team of experienced professionals can help you get the job done right, and make sure that the results are something that you and your family can enjoy for a long time to come. If you need landscaping services in Chesapeake, VA then please call Winesett Nursery and Landscaping at 757-426-7880 or complete our online request form.